Since my outlook.com instance was upgraded to the ‘new’ experience, I’m having all kinds of issues. Two of the most annoying ones: my rules (junk sweep for instance) are not working. Not at all. Also, the synchronization on my mobile phone was pretty crappy, especially for people / contacts. It would not sync certain contacts (again: not at all) and others it would sometimes sync and sometimes delete. Being a nerd I could not stand this, so I went on to find a fix. I tried all the logical stuff first: reset the account (which is an option in the app). Switch on / off contact syncing. Remove and add the account. Remove the app and reinstall it. I really tried pretty much everything, nothing worked. With the update, legacy outlook.com account were moved over to a new infrastructure which is built on Office365 bits and pieces. It’s still Outlook.com, but it looks an awful lot like Outlook Online from Office365 now. And if you know Office365, you also know it’s basically Exchange behind the scenes. That last sentence is a hint to the solution. Instead of normally adding my account as an Outlook account (which it is), I added it as an Exchange account instead. Username: your full e-mail address. Can be @outlook.com or another Microsoft account name. After adding, give it some minutes to sync. 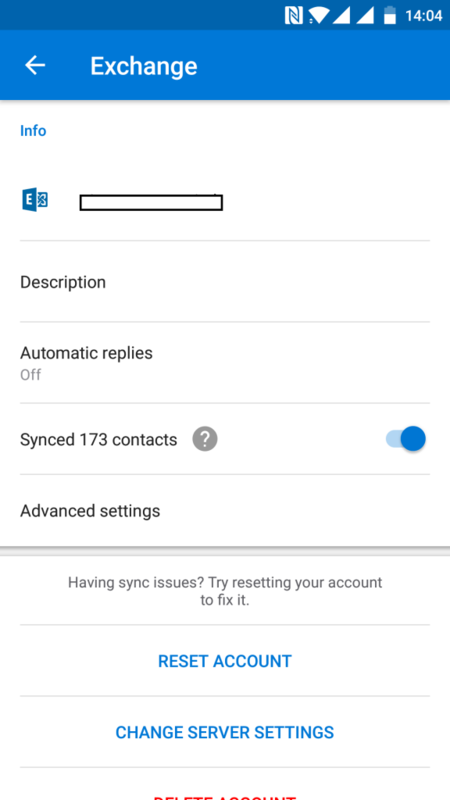 Make sure you’ve got the contact sync enabled as well in settings. And as you can see below, I now have a properly syncing account on my phone. F-ing finally. Now for that rules issue….